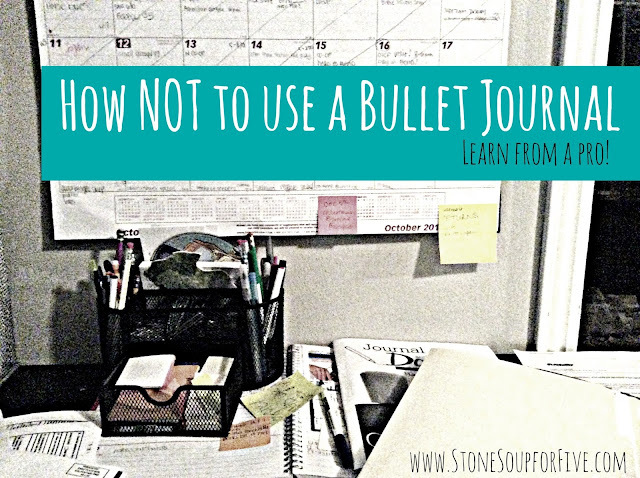 Bullet Journal Law: If you use a Bullet Journal, LOOK at the Bullet Journal. living out the plan? Not so awesome. Kinda stink at that part, actually. Today I missed an appointment with my friend who I really wanted to hang out with. And last night I missed time with our Bible study at Panda Express (yum!) because I didn't even notice that flashing button on my answering machine. I can be the world's best bullet journaler, but if I'm not actually LOOKING at it, what's the point? So, I'm writing out my evening routine, again. And including an evening review and plan ahead time. Boys clean kitchen and sweep WHILE I CHECK BULLET JOURNAL, CALENDAR, PHONE, AND EMAIL MESSAGES. Finish final spiff up of kitchen (the boys do a great job knocking down the big stuff, but they never do it to the detail that I like... just 5 min and it'll be nice to wake up to). Set GetColdTurkey.com so I cannot check email or facebook until 10am (or later). So, I'm trying this for the new week and HOPEFULLY I'll be more on top of life and not miss out on all the fun. Ugh. Have any of you figured out a way to make a crazy life work? I'm not an electronic planner kind of girl, so it has to be with pen and paper and cool tricks. And because I'm obviously SO awesome at all of this, next week I'm going to be interviewed by the Totally Together Mystie Winckler on how I use my Bullet Journal. It's going to be great! [sarcasm font] I do hope you'll join in though, because it's going to be a lot of fun, and you can ask questions! I found your blog through Mystie's Work the Plan course, and I can't wait for Wednesday...seriously! I've been waffling between paper and digital planner, but I want to commit to paper for my next interval since I am SO easily distracted on my computer/phone/tablet/etc. And I have the exact same issue - love making a plan and checklists, but executing or actually remembering to look at my plan? Um, not so good at that! Oh good! Yes, I'm right there with you! I hope you can make it live on Wednesday to ask any questions! Should be fun! I am the same way! I'm getting better. I uninstalled facebook, messenger, pintrest, and a few other distractions off the tabby. I'm looking forward to Wednesday also. Yes, I really struggle with getting side tracked if they're easy to access. Good for you for deleting them! Hope to "see" you there Wednesday! Yup. You and me both! Glad to know there are other planners who struggle with the follow through!